Reflecting on my time in Dubai recently I realised that the Burj al Arab, being the only '7* hotel' in the world is probably one of the most photographed hotels in Dubai. Built on a man made island some 280 meters off shore it's definitely one of the main landmarks in Dubai. 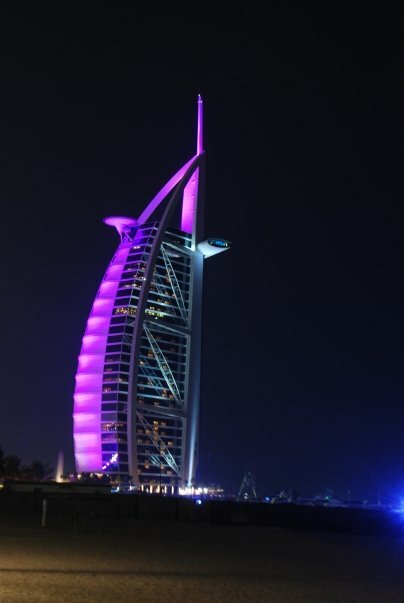 Here it is at night, the sail lit up in purple, the colours rotating through the rainbow every few seconds. It is a beautiful piece of architecture from all angles, particularly sailing past it. 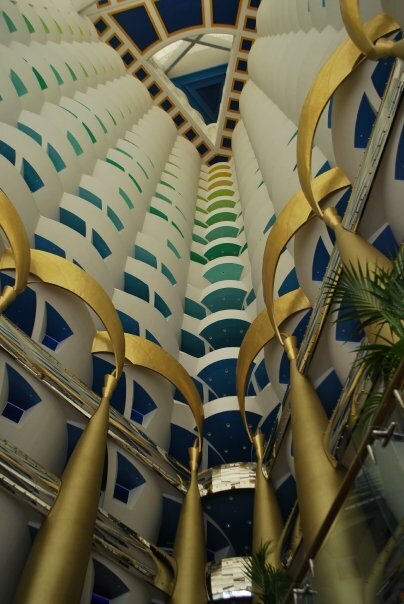 But have you seen inside the Burj al Arab? Being one of the most expensive hotels in the world with the Royale Suite being nearly US$20,000 I can only imagine what it would be like to stay here. I did however have High Tea here one day while I was living here and although there was sandstorm which wiped out all sweeping views over Dubai (worst timing I know), we did get to explore inside. The centre of the hotel reception area is open all the way to the tip of the tower, offering a pretty spectacular atrium. That is the opulence of Dubai! It's an amazing hotel. I love the symmetry in it. On our tour we were tour that actually 7 star hotels don't exist - it was a phrase coined by a journo to describe its opulence and it's stuck ever since! Now this is Informative writting about Dubai, Keep up the good work.